At the turn of the century, no one imagined that Turkey would embark on a major project to promote itself as a cruise ship destination. Three locations in particular, were targeted as ideal places for cruise ship passengers to disembark and see the best of what Turkey has to offer. These were Kusadasi and the ancient ruins of Ephesus, Izmir city and the country’s largest city of Istanbul. The third one turned out to be immensely popular as passengers flocked to see the former capital of both the Byzantine and Ottoman empires. But are cruise ships still going to Istanbul? Unfortunately, Turkey’s reputation as one of the most visited destinations in the world has taken a tumble of late. Safety and security concerns have led some cruise ship companies to pull out of visiting Istanbul, instead replacing the stop with ports in Greece. 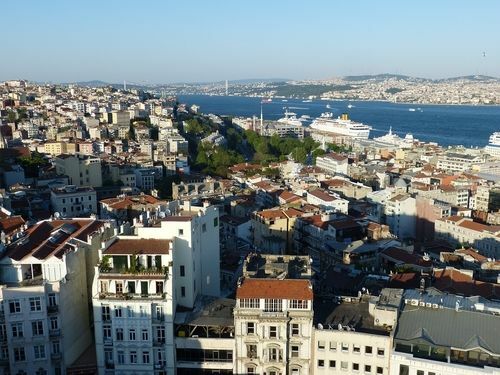 However some other cruise companies are still planning Istanbul into their schedule including Crystal, who are owners of the 13 deck Crystal Serenity, a ship voted number one in the world by readers of Conde Naste Travel. Where is the Cruise Ship Port in Istanbul? It is located in the Karakoy district, near the well-known landmarks of Galata Tower and Bridge. This commercial neighbourhood belongs to the bigger Beyoğlu district on the European side of the Bosphorus. One of the most frequent questions asked about the port is how far is it to the Grand Bazaar and Sultanahmet district? It is roughly 3.5 kilometres from the cruise ship port of Karakoy to the Grand Bazaar. In theory, this should take just 15 minutes in a taxi however sometimes traffic conditions prolong the journey. If you are on foot, instead head over Galata Bridge and up Fuat Pasha Caddesi to reach it. From Karakoy to the Sultanahmet district, it is 5 kilometre and a taxi journey would be roughly 30 minutes, taking into account heavy traffic. Taxis use meters and charge an initial setting off fee of 2.40 Turkish lira and 2.70 for every kilometre after that. If you are travelling from the port to Istanbul Ataturk airport, this 22-kilometre journey takes roughly an hour in heavy traffic. Alternatively, the Sabiha Gokcen International Airport is further away at a distance of 42 kilometres and roughly a 90-minute transfer time. 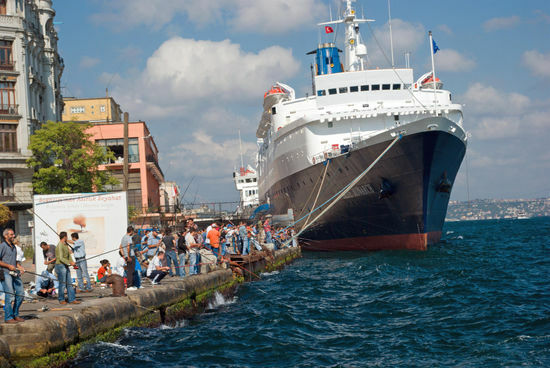 What is there to do from the Cruise Ship Port of Istanbul? As mentioned above, two of the most popular things to do in Istanbul is to explore the Grand Bazaar and the Sultanahmet district. Dating from the Ottoman Empire, the Grand Bazaar is one of the largest markets in the world and an ideal place to buy traditional Turkish carpets. The sprawling networks of alleys and courtyards take a full two hours to explore at a slow pace. The gem though is the old city district of Sultanahmet that holds marvellous landmarks from the Byzantine and Ottoman empires. See the former Hagia Sophia church, mosque, and museum. Across the square is the Blue mosque, a fully practising place of worship dating from the 17th century that is also open to tourists. Across the old hippodrome square and down a flight of stairs, the Basilica cistern, a former water source proudly displays the odd but unique upside down heads of medusa. Around the corner, a full morning is needed to explore the harem, kitchens, circumcision rooms, armoury and more in the Topkapi palace that was first home of the Ottoman sultans when they conquered in 1453. Nearby is the Istanbul Archaeological museum, one of the greatest in the world that displays ancient artefacts from throughout history. Exploring the Sultanahmet district is a pleasant and enjoyable experience but repeat visitors to Istanbul should wander the Taksim and Beyoğlu districts that are just a short walk from the port. Widely famed as having the busiest street in Turkey (Istiklal Avenue), Taksim is popular for shopping and nightlife but behind the scenes, interesting antique shops hold a treasure gem of personal items from history. The Pera Museum displays the Tortoise Trainer, one of the most expensive paintings ever sold in Turkey, while the Galata Whirling Dervish Museum portrays the life of this spiritual sect of Islam. Also, take a stroll through Flower Passage or even sit down and enjoy a meal. Famed as the place where Russian immigrants in the early part of the 20th century sold flowers, it is one of the city’s most respected landmarks. Still on the European side of the city, two neighbourhoods are making a name for themselves because of their historical Jewish and Greek heritage. Urban tours sell out quickly as local guides walk customers through the streets of Fener and Balat to introduce them to a rarely talked about cultural side of Istanbul. If you are flying out of Sabihan Gocken airport on the Asian side of Istanbul though, extend your trip by booking a hotel overnight and be introduced to neighbourhoods and districts that are totally different from the European side. Including well known places such Uskudar and Kadikoy; these residential areas will give you a great insight into daily lives of citizens in Turkey’s biggest city. As Turkey’s golfing capital, Belek's reputation stems around the sport but once arriving, prospective buyers find out there is much more to do and see, once you come off the world championship golf courses.